Pop Culture Safari! 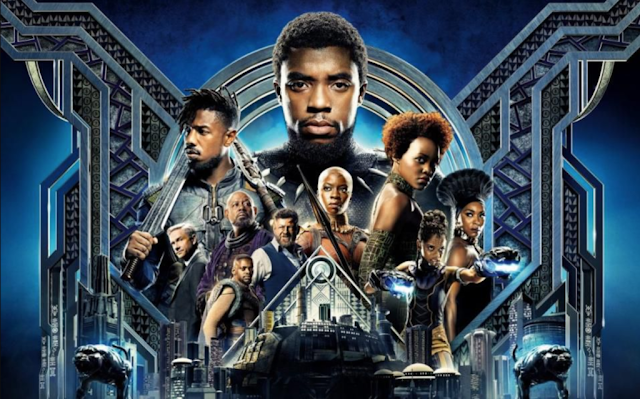 : Review: "Black Panther"
Jack Kirby said Black Panther was a character he needed to create back in 1966. Marvel had black readers, but no black characters. It was the heat of the Civil Rights movement and Kirby felt compelled to make a statement. Black Panther's first appearances in The Fantastic Four didn't comment directly on issues of race and America's treatment of African Americans, but Kirby was making a statement through example: Heroism, thoughtfulness, commitment, intelligence and integrity are all qualities to be respected and admired. And they are present in all types of people. Fifty-plus years later, Marvel has recognized Black Panther as the character we all need, now. T'Challa, the Black Panther, King of Wakanda is strong, intelligent, thoughtful, brave. He's excited by science and embraces its potential to make life better. He's compassionate and works for humane solutions. He honors his ancestors and welcomes their wisdom. He respects the strong women in his life and seeks their counsel. He wants his nation to lead by offering help to the less fortunate and by building bridges. Who doesn't that sound like? Like Kirby in the 1960s, Marvel isn't making an overt statement here, but it's making one nevertheless. "Black Panther" asks us, "what is a hero? What qualities are worthy of admiration? What is a leader?" 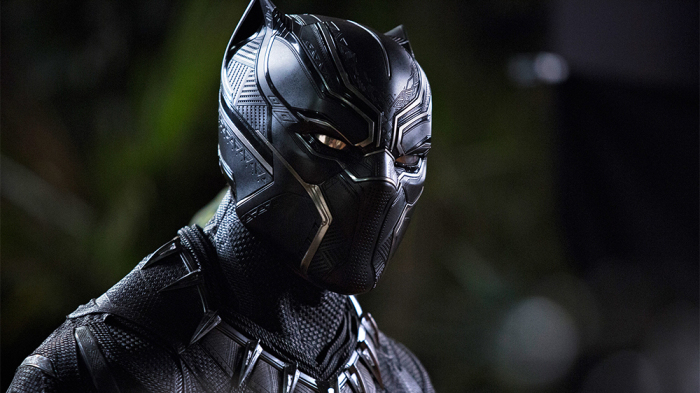 Chadwick Boseman as T'Challa is a refreshingly un-tortured, un-snarky superhero. He's grieving for his lost father and uncertain he's prepared to assume the throne, but he's not wallowing in self-pity or out for vengeance. He's seeking to do what's right for his people and his family. He was noble before he ever took the throne. 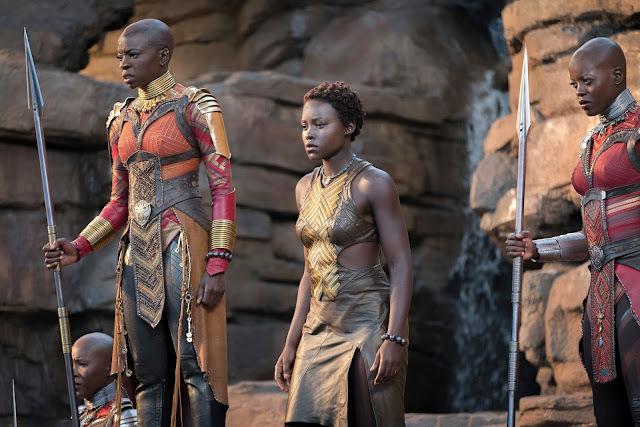 Black Panther is a very quiet, almost introverted character, who surrounds himself with more assertive, more extroverted allies - all of them women. Lupita N'yong'o is excellent as his love interest, Nakia, a spy. Florence Kasumba is Ayo, his stoic and strong bodyguard, and Letitia Wright nearly steals the show as his brainy kid sister, the Q-like creator of all sorts of vehicles and gadgets the Panther uses in his fight for what's right. The film's story blends elements of Bond-like intrigue with 1970s-style Marvel "jungle action" and takes obvious inspiration from the current, excellent, Ta-Nehisi Coates-scripted Black Panther comic book series, with its explorations of nation, power and responsibility. Martin Freeman appears as a Felix Leiter-like CIA agent, a flesh-and-blood Andy Serkis is amusingly and psychotically over the top as Ulysses Klau (spelling it that way makes it less silly than "Klaw," don't you know), while Angela Bassett plays T'Challa's mother and Forest Whitaker his spiritual advisor. The excellent Michael B. Jordan ("The Wire" and "Friday Night Lights" - plus he was Johnny Storm in the 2015 Fantastic Four film) is both chilling and moving as the Panther's cousin and adversary, the unfortunately and improbably named, Erik Killmonger. 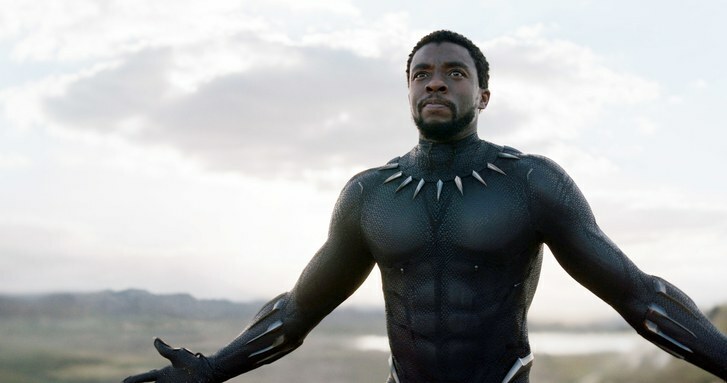 More than 50 years after Kirby introduced the Black Panther as comics' first black superhero, he's now the first black superhero on the big screen. It's ridiculous that we've had to wait so long for such a groundbreaking moment, but it's good that it's finally arrived. "Black Panther" is a revitalizing, refreshing, thoughtful and thought-provoking film which also plays as a fun, adventure-filled, straight-ahead superhero story. Kids like to pretend they're superheroes. We should encourage them to emulate this one.